“The living, the living—they praise you, as I am doing today; parents tell their children about your faithfulness” (Psalm 38:19). Passover is a story that has been retold for thousands of years. It is the account of God’s miraculous deliverance of His people from slavery to freedom, from despair to hope, from darkness to light. It encompasses the eternal truths of His character and personal involvement with His people. It endures as a testimony to His grace and merciful redemption because of the faithful who have told the story to their children from the time of ancient Egypt through the days of Messiah until this very day. 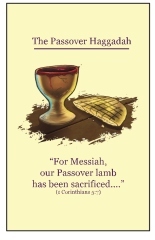 Our Passover Haggadah is a compilation from several different sources: the Covenant Community Church in McCook, Nebraska, two Messianic Haggadahs that were formatted from a traditional Jewish one, and our own personal insights from years of celebrating the memorial to the LORD’s Passover. Messiah Yeshua is the reality in the shadows of Passover and his last Passover seder is central to our Haggadah. From it you will learn more about your Savior, his words to his followers and this ”appointed time” of God. Use the How-to celebrate Passover to prepare your table and food in order to have a memorable celebration. Kindle edition available on Amazon.com. A How To – Celebrate Passover! The most important part of celebrating Passover is having a ‘guide’ that explains not only what to do, but what you are doing. When our family began celebrating the Passover many years ago, we used a Messianic Haggadah (a telling of the account) put out by a well-known Messianic Jewish ministry. It was simple and exactly what we wanted and needed. As the years passed and we learned more about Yeshua in the Passover, we found there was a depth that was missing in the traditional-based Haggadah. We decided that we should write our own. We incorporated significant traditions that Yeshua used at his last seder into our Passover Haggadah as well as Scriptures that highlighted the shadows that became reality through Him. Everyone at the seder or at least every two people will need a Haggadah. If you would like to use ours, it can be purchased on amazon.com. We have kept the price minimal with no profit to us so that anyone can afford to buy several or, in the case of a church, purchase them for their guests and pass the cost on. As hosts, we provide Haggadahs for each of our guests who come celebrate in our home so they have a way to continue the celebration in their home the next year. If you’re thinking of having a seder with family, friends or even a church celebration, remember this is to be a FEAST. Make sure you include a main dish of beef, chicken or even lamb that will serve everyone. I suggest a main course per each 6-10 people. You can have a small group prepare all the food or invite each family to bring a dish of something to share like a fruit salad, green salad, vegetable or dessert. Ask that they do not bring anything that is leavened (with yeast or soured dough) or made with anything found in Leviticus 11 – especially pig products (ham, pork, bacon, sausage) and seafood. I have linked some recipes for your convenience that we use for our seder dinners that include a main course, side dishes and unleavened desserts and cookies. There are some traditional foods that can be served during the seder meal. Carrot tzimmes, matzah ball soup, kugels: sweet, banana, mushroom, and sponge cake or macaroons are all wonderful ways to include others in planning your meal. Fresh fruit salads and green salads are welcome at a seder. I always serve lamb though it is not tradition to do so. Some people serve Gefilte Fish, Roast Chicken or Brisket. When setting the table, use some white table clothes (plastic, paper or even white sheets) to make your table look like a ‘set apart’ dinner because it is! It is a ‘Feast of the LORD’ – a memorial not just to the Passover found in the book of Exodus, but a rehearsal dinner for the Wedding Feast of the Lamb. Everyone will need a plate, soup bowl, forks, knives, spoons, napkin and 2 cups. Paper and plastic products are fine to use, and with a large group makes clean-up much easier. One cup is for drinking water; the other is for the wine or grape juice that will be consumed during the seder. If you can, use wine glasses. Plastic ones can be found in most party stores. If you have a smaller group, feel free to use dinnerware and silverware. The seder plate will be the centerpiece on the table(s) along with the matzah, unleavened bread. If you have more than one table, you will need one seder plate for each table to make it easier for people to share the items. 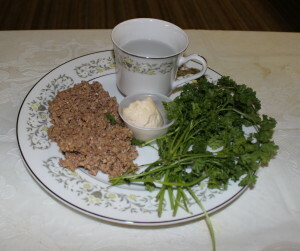 Special foods will put on each plate: charoset (apple mixture), bitter herbs (generally horseradish), sprigs of parsley (one for each person) and a cup of salt water for dipping. NOTE: We do not use an egg on our plate to remember the destruction of the Temple as it too much resembles the spring ritual of Easter. We place a rock on our plate as Yeshua prophesied the destruction of the Temple in Matthew 24:1-3 and we still await its restoration. When you are setting your table, set one extra place for Elijah. With a large group, this setting could be at the leader’s table keeping it separate from the guests. This is a tradition based on the Scripture that Elijah will come before the Messiah. Traditionally, a child participates at the end of the seder by going to the door to see if Elijah has come. We put our ‘check for Elijah’ at the beginning of our seder because our children were concerned that if he was at the door, we had already eaten and he would have no food! There are four cups of wine consumed during the seder. This means you should have enough wine (or grape juice if you want to avoid alcohol) for everyone who is coming. You will need one wine glass/cup for each person to fill four different times. Matazh or unleavened bread is central to a seder dinner. You can buy it at a local store (Costco sells it in huge cases for large groups) or make it at home. There is no substitute for matzah at a seder so be prepared with a lot as you will also eat it during the next week of Unleavened Bread. At each table you will need plates of matzah. Next to the leader of the seder there will be another plate of matazh for the ‘unity of matzah’ called a ‘matzah tosh pillow’. This pillow can be created with a plate and four napkins. Place an opened napkin on the plate, then place one matzah on top. Open another napkin and place it on top of the matzah, then add another matzah. Top that matzah with another napkin and a matzah. Cover the last matzah with the fourth opened napkin. You should have a ‘unity’ of three matzahs and four napkins when you’re done. During the seder, the leader will reach into the middle of the matzah tosh and remove the center piece. It will be broken in half. One of the halves is wrapped in a fifth napkin and set aside. If you find that you celebrate the Passover year after year, you can also make or buy a matzah tosh. The word afikomen means ‘dessert.’ It is the piece of matzah that was wrapped in the fifth napkin. It will be the last food eaten at the seder. All other desserts will be eaten before finishing the seder so the taste of the afikomen is allowed to ‘linger’ in the mouth. The afikomen is part of the bread and wine that Yeshua shares with the disciples at his last seder. There are special instructions for the afikomen after the meal has been eaten. It becomes a game that includes the participation of the children. The afikomen can either be hidden or stolen by the children and redeemed for a price. In our family, my husband hides the afikomen while everyone is eating the seder dinner. Before sitting down to finish the seder, he asks the children to find it. It is ‘redeemed’ for a prize. Over the years our prize has changed depending on the ages of our children. We have given stuffed animals, little trinkets and money. If we know there will be small children at our seder, we try to have an appropriately aged gift. Pillows are an essential item during a seder. Yeshua and his disciples reclined at the table and pillows are a way to emulate this behavior. Our family actually sets a low table made of a piece of drywall sitting on plastic tubs and covered in white table cloths. In this way, we actually do sit on the floor and recline with pillows by the table. If you have a larger setting, it may not be possible for everyone to bring a pillow, so just make sure that someone at each table has one, especially the leader of the seder. In a traditional seder, there is a time for hand washing. Since Yeshua washed his disciples feet at the Passover, we have made the hand washing ceremony into a foot washing fellowship time. You will need a basin, pitcher of water and some towels. Explain to your guests before they come that you will be doing a foot washing as Yeshua/Jesus did so they come prepared to remove their socks and shoes. If someone comes who cannot remove their shoes, their feet can be massaged. During the foot washing time, play quiet music while everyone blesses each other by washing feet. Generally, we have husbands and wives wash each other’s feet while children and parents wash one another. It is a wonderful time to watch servanthood in the lives of children! At some Passover celebrations, the time of foot washing is a time to promise to pray for one year (until the next Passover) for the person washing your feet. If you are in a church setting and want to incorporate the prayer, men may wash men’s feet and women wash women’s and boys and girls divide between the men and women. Feel free to incorporate music during your seder. You can choose to sing, dance, play instruments or just listen to songs – recorded or live – about the sacrifice of the Lamb of God, your part in the Commonwealth of Israel, or just praise and worship for the God of Israel and what He has done for us through His Son. We generally begin our seders by dancing the hora, the Israeli national dance, to bring people into the joy of the celebration. There are songs that are traditional to the seder dinner. You will be singing “Dayenu”meaning “It Would Have Been Enough.” The words are simple and the tune very catching. You’ll find yourself singing “Dayenu” throughout the week of Unleavened Bread. Video with music. At the very end of your seder, it is traditional to sing or say “Lashana Haba bi Yerushalayim” which means Next Year in Jerusalem! May it be so … and may we celebrate next year in Jerusalem with the Messiah, the King of the Kings at His Wedding Feast! Video with music. Here is a basic Passover Checklist as you prepare to celebrate your seder. Feel free to print it and use it along with the other recipes and links on this page. If you are preparing your own seder or if you’re just wanting to learn more about Yeshua (Jesus) in the Passover, don’t hesitate to ask. May you be blessed as you celebrate the memorial of the Passover as Yeshua did with his disciples. May you not only see your deliverance from slavery in Egypt as part of the commonwealth of Israel, but your redemption from death to life through the blood of the Lamb. May the seder you celebrate prepare you for the week of Unleavened Bread and the Feast of Firstfruits of Yeshua’s resurrection from the dead! HalleluYAH!